Leg Avenue’s 3 PC. Dark Goddess costume includes a primitive pleated dress with gold ribbon accents and draped shoulder detail, gold wrist cuffs, and matching head piece. A beautiful dress for a Roman goddess or Cleopatra! Look at our Peggy Sue wigs in black to complete the look! SKU: 85180X. 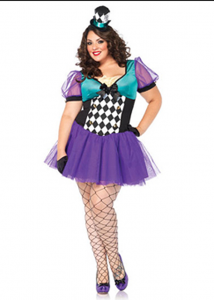 Category: Plus-sized Women's Costumes. 3 PC. Dark Goddess Costume includes pleated dress with gold ribbon accents and draped shoulder detail, gold wrist cuffs, and matching head piece. Be the first to review “Dark Goddess Costume” Click here to cancel reply.